Background: Multiple myeloma is an incurable plasma cells neoplasm. Chemotherapy by the alkylating agent Melphalan was introduced in 1958 and with the addition of prednisolone in 1964 the combination (MP) improved the survival of these patients and remained the standard treatment for over twenty years. In 1998 the antiangiogenic reagent thalidomide was tried and claimed to further improve survival of these patients including those with advanced disease. Objectives: This study was conducted to determine the difference in survival of multiple myeloma patients in Nanakaly Hospital in Erbil city before and after the use of thalidomide. Patients and Methods: This retrospective study was carried out at Nanakaly Hospital over a period of six years from January 2007 to March 2013. The records 123 patients with symptomatic multiple myeloma who were treated in this period were reviewed, including their clinical and laboratory profiles, as well as the survival of each group. All patients were selected according to the WHO diagnostic criteria. Results: The patients had a median age of 59 years and the male: female ratio of 1.2:1, Chemotherapy based treatment was used in 38 patients as compared with 85 patients who used thalidomide based therapy. Median survival was 34 months for thalidomide compared to 19 months for chemotherapy-only treated group (P= 0.001) Conclusions: The introduction of Thalidomide as a therapeutic option in Iraqi patients improved survival of symptomatic myeloma significantly compared to chemotherapy alone. Background: Hemodialysis is the most common method used to treat advanced and permanent kidney failure. Anemia in end stage renal disease is almost universal. It can be caused by erythropoietin deficiency, blood loss, iron deficiency, shortened red cell life span, vitamin deficiencies, the "uremic milieu," and inflammation. Chronic inflammation plays an important role in the disease process and high levels of inflammatory markers like hepcidin, which mediates the anemia of inflammation, appear to accompany reduced renal function. Serum ferritin is an acute phase reactant and thus may also be elevated in inflammation. Objectives: The aim of study was to compare the hematological parameters in patients on hemodialysis and display the correlations between the duration of hemodialysis and hemoglobin, erythrocyte sedimentation rate, C-reactive protein, hepcidin and ferritin. Patients and methods : This is a case control study. It was conducted at Al-Hayat center for hemodialysis at Al-Karama hospital, and included 60 adult patients with documented end stage renal disease on hemodialysis. The frequency of hemodialysis was 2-3 times/week. Also 20 healthy individuals were recruited as control group. Estimation of complete blood counts, erythrocyte sedimentation rate, biochemical parameters, C-reactive protein and hepcidin were done Results : The majority of patients (70%) were > 45 year old, and the male: female ratio was 2.8:1. The mean hemodialysis duration was 18.6 ± 2.5 months (range: 1 -120 months), and 70% of patients were on hemodialysis for > 11 months. There was statistically significant decrease of absolute lymphocyte count, RBC count, hematocrit, hemoglobin and platelet count (p <0.05), and a significant increase of red cell distribution width levels in patients than controls (p<0.05). A significant higher levels of blood urea and serum creatinine (p < 0.001), and lower levels of albumin, iron, transferrin and TIBC were found in patients than control (p << 0.003). The mean serum hepcidin, ferritin, C-reactive protein and erythrocyte sedimentation rate were significantly higher in patients than control (p < > 0.005). There was a significant difference in mean CRP when compared with ferritin cutoff level of 800 ng/ml (p<0.009). There were slight increase in the levels of ESR, CRP, Hb, hepcidin, and ferritin with increased duration of hemodialysis but were all found to be statistically insignificant (p>0.05). Conclusions: Anemia and low mean absolute lymphocyte count and serum albumin level; all predict poor survival in HD patients. End stage renal disease patients had high levels of inflammatory markers which showed slight insignificant increase with the duration of hemodialysis. Background: Thalassemia are group of genetic disorders in which production of normal hemoglobin (Hb) is partly or completely suppressed because of defective synthesis of one or more globin chains, vary from asymptomatic forms to severe or even fatal entities . People with thalassemia make less hemoglobin which results in mild or severe anemia present as microcytic anemia. thalassemias are classified according to which chain of the hemoglobin molecule is affected. In α thalassemias, α globin chain is affected, while in β thalassemia, production of the β globin chain is affected. 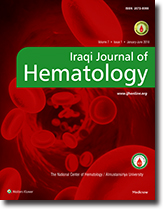 Lipid abnormalities have been detected in different types of beta thalassemia, suggested mechanisms including plasma dilution due to anemia, accelerated erythropoiesis resulting in increased cholesterol uptake by macrophages and histiocytes of the reticuloen-dothelial system, defective liver functioning due to iron overload, macrophage system activation with cytokine release, and hormonal disturbances, Objectives : The purpose of the study was to examine the blood lipid profile in children with beta-Thalassemia major in Iraq , and to determine the factors that affect it. Material and Method: Blood lipid profiles of forty-five patients between the ages of three and ten years with beta-Thalassemia major who were receiving regular chelation therapy followed by from paediatric clinic of Ibn-albalady hospital were examined retrospectively. Blood lipid profiles of thirty healthy children were taken for use as the control group. Results: Hb and Hct values of the group with Beta-Thalassemia major were significantly lower than the control group . Ferritin values in the group with Beta-Thalassemia major were found to be significantly higher than in the control group . Cholesterol, HDL-cholesterol, LDL-cholesterol levels were found to be significantly lower in patients with Beta- Thalassemia major than in the control group , while the triglyceride level was found to be higher . Conclusion: lower total cholesterol, LDL-HDLcholesterol and high TG was found in BTM groups compared to healthy control participants. The suggested mechanisms for the decreases in lipids are increased erythropoiesis and cholesterol consumption, iron overload, hormonal change and oxidative stress in BTM. Background: Pediatric acute lymphoblastic leukemia (ALL) is a heterogeneous disease with diverse genetic subtypes and different clinical behavior. ALL with BCR-ABL is a subtype with distinctive response to treatment. Objectives: This study aims to study the expression of BCR-ABL transcript in Iraqi pediatric ALL patients. Patients, materials and methods: A case-control prospective study was conducted to study the expression of minor and major BCR-ABL fusion genes in bone marrow aspirates of 48 pre-treated ALL patients and 46 control subjects using qPCR technique. Those aspirates were collected from Children Welfare Teaching Hospital in Baghdad over a 1 year period from July 2013 to June 2014. Results: From 48 patients with ALL 21 were males and 27 were females. Age ranged from 2 months to 13 years with a median age of 5 years. Twenty six of these patients aged between 1-5 years. Molecular screening detected minor BCR-ABL transcript in 2.1% of ALL patients whereas major BCR-ABL transcript was not expressed in any of ALL patients. Contrary to the control group, minor BCR-ABL transcript was detected in three samples. Conclusion: The molecular prevalence of minor and major BCR-ABL fusion gene in Iraqi children with ALL is to somewhat similar to previous reports worldwide. Portal vein thrombosis is a life threatening complication after splenectomy especially for thalassemia and myelofibrosis and require a high index of suspicion to establish an early diagnosis. Prompt anticoagulation should be initiated once the diagnosis is established to prevent potentially fatal complications such as bowel infarction or later portal hypertension. In this case report, we describe a patient with thalassemia intermedia who undergo splenectomy for massive splenomegaly and developed acute portal vein thrombosis .Anticoagulation started but another CT abdomen done 2 months later showed no change in thrombosis in addition , the patient escaped follow up.